The d20 stats for Draco marciano. Description: These scrappy little cousins of the Great Wyrms have been bred for their small size, strength, and speed. They are often kept as the pets of wizards, who commonly train them for fights with other small dragons (or humanoids) for gambling purposes. This practice, known as "Drac Fighting" is illegal in most civilized areas. Few, however, are willing to argue with a group of wizards with pet dragons. The Boxing Dragons stand between 5 and 6 ½ tall, and typically weigh over 350 pounds. There are weight categories, ranging from "Bantam" (average 200 pounds) to "Super-Heavyweight" (over 700 pounds). The greatest difference between the various categories is the weight. The height does not increase. The larger of the species are generally friendly until provoked, while the smaller ones tend to be just plain mean. 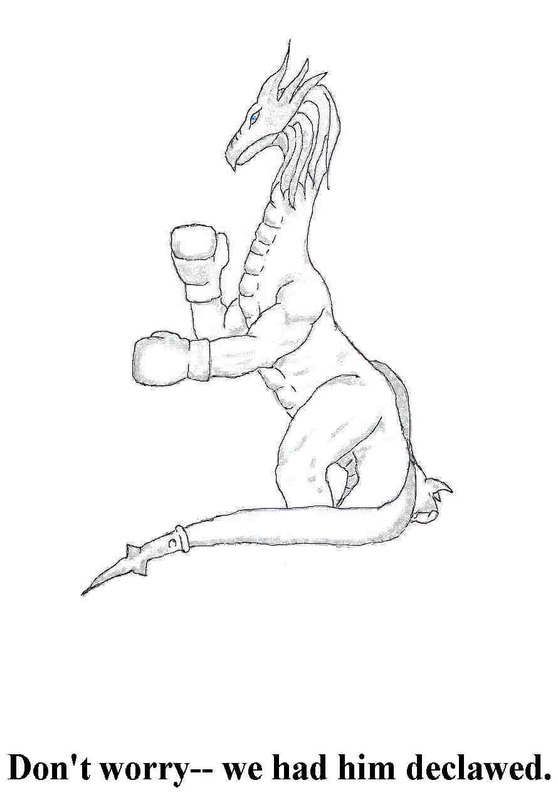 The Boxing Dragons' most common method of combat is flailing its opponent with either its bare fists, or with padded gloves, until its opponent is incapacitated. At this point, Draco marciano will raise its hands in the air, and bounce on its hind legs. The Boxing Dragon will only accept one opponent at a time. Efforts to introduce more than one opponent at a time have proven unsuccessful. Draco marciano will attack the physically strongest opponent first, and will punch that opponent senseless. Should the Boxing Dragon find itself outnumbered, it will resort to a tail whip, which trips opponents (on an opposed Str roll). This trip attempt does not provoke an attack of opportunity or a trip attempt by the opponent(s). Draco marciano is a solitary creature, preferring to spend its time building its strength and stamina in preparation for its next victim. If encountered with other creatures, it may be with another Boxing Dragon of the same size (or one category larger), or with a humanoid Fighter (4 levels higher than the Draco marcianos HD, known to the Boxing Dragon as "Coach"). They will ignore any creatures, unless a direct physical threat is made. Even then, they will measure the threat in the most arrogant way possible, and dismiss it as "not worth (their) time." "Requires the use of the Dungeons & Dragons(R), Third Edition Core Books, published by Wizards of the Coast(R)"
Unofficial mascot of the Sacred Wolf creative team.